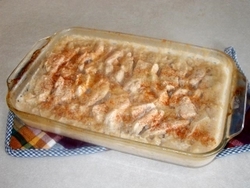 Preheat oven to 350 degrees F. Line bottom of a 9×13 inch baking dish with chicken breasts. Spoon prepared stuffing mix over chicken. Mix the cream of chicken soup, cream of celery soup, sour cream, and lemon juice. Pour mixture over top of stuffing. Bake uncovered in the preheated oven for 45-60 minutes, until chicken juices run clear.